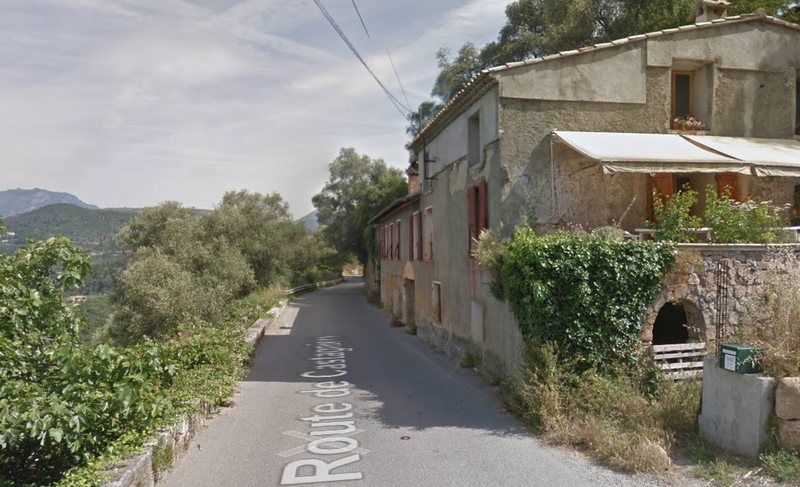 It brings us through the southern outskirts of Tourrette-Levens, past the perched village and castle on our right before joining Boulevard Léon Sauvan in the centre of the lower part of the village. The featured image at the top of this blog is a copy of a map from the 1800s. Careful inspection of the image will show the purported route of the tramway between St. Blaise and Levens, marked as a road (or track) on the map. The quality of roads in the area at this time was poor. Images on postcards show that roads were little more than dirt tracks alongside the trams. 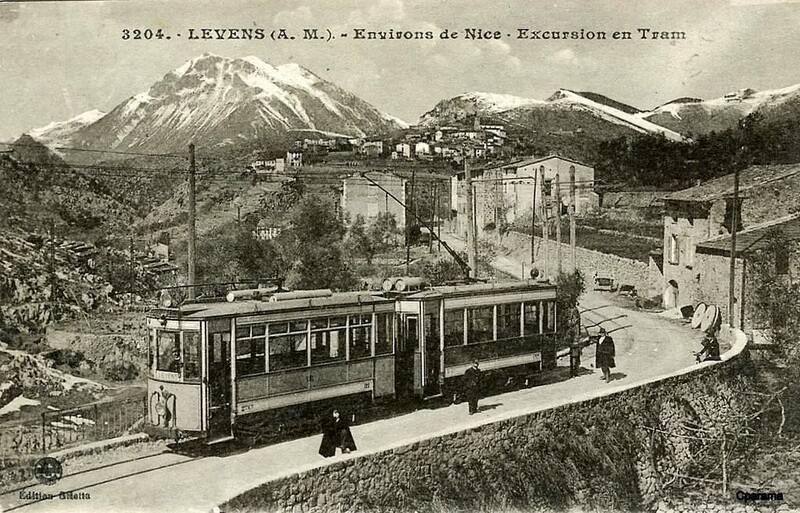 When they were first installed the trams must have been a major step forward for transportation in Les Alpes Martimes. The possible route between St. Blaise and Levens is marked on Satellite images later in this blog. 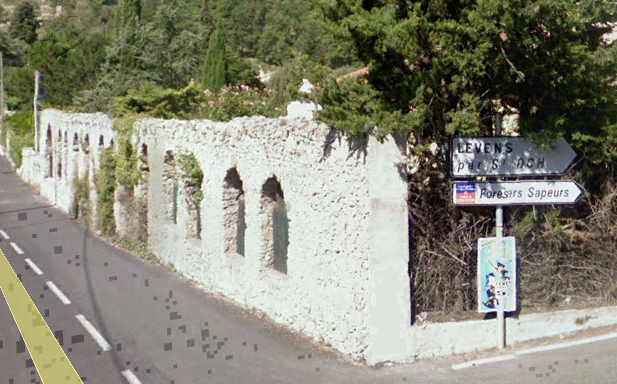 I have come to the conclusion that the route via St. Blaise and Aspremeont was considered but never built. This is suggested by Jose Banuado and By Jean Robert  as pointed out by 242T66 on the Passions Metrique et Etroite Forum. So, in the sprint of all good railway modellers’ ‘might have been’ stories which support their layouts. 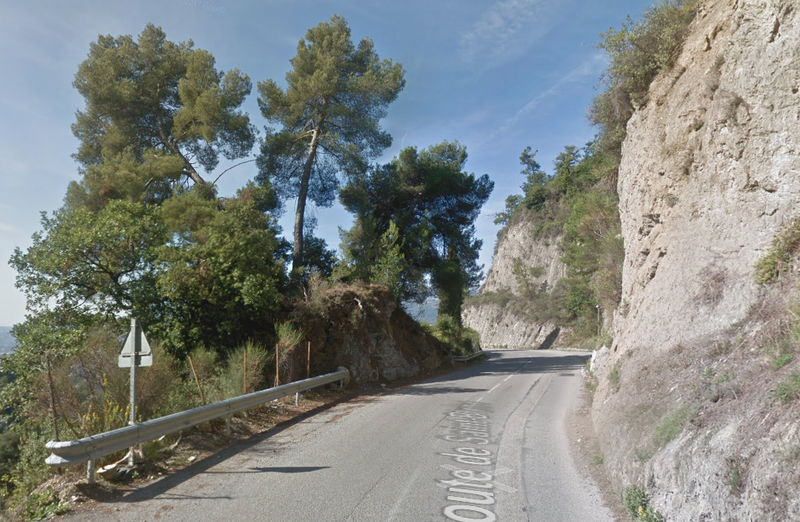 Here is my might have been, for the route via Aspremont and St. Blaise. 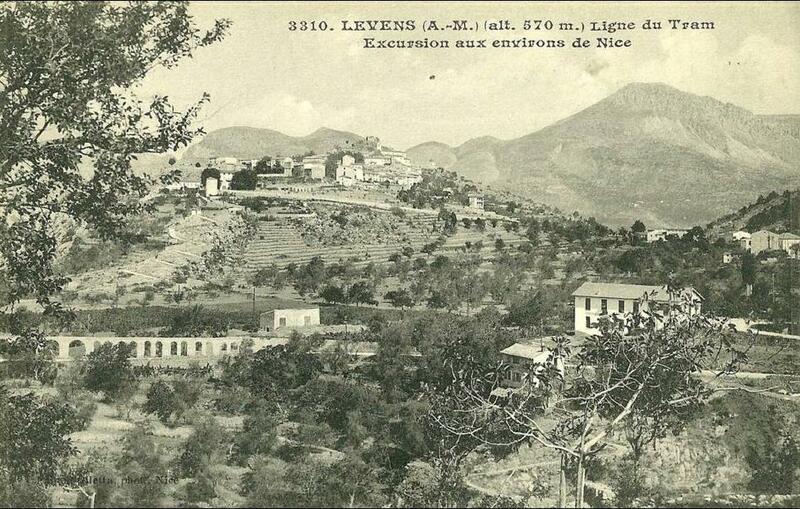 ……..
A ‘Might Have Been Tramway Route’ Between Tourette-Levens and Levens, via Aspremont and Saint-Blaise!! 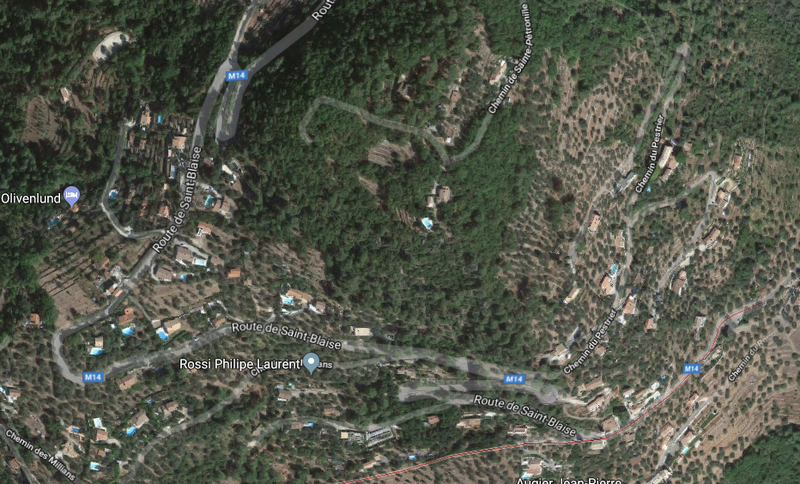 What might have been …………….. A relatively sharp left turn took the supposed tramway out of Tourrette-Levens towards Aspremont on what is now the M719. 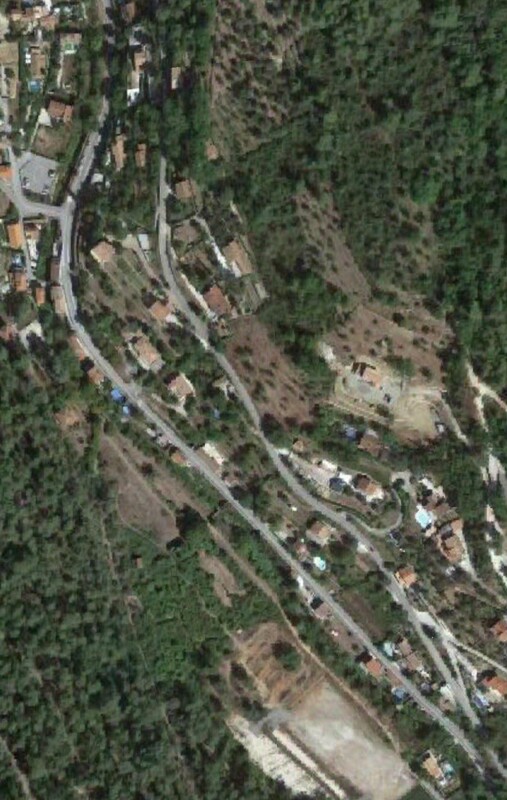 On the first satellite image below the junction can be seen middle-right and the rout heads up to the centre-top of the image before exiting top left. 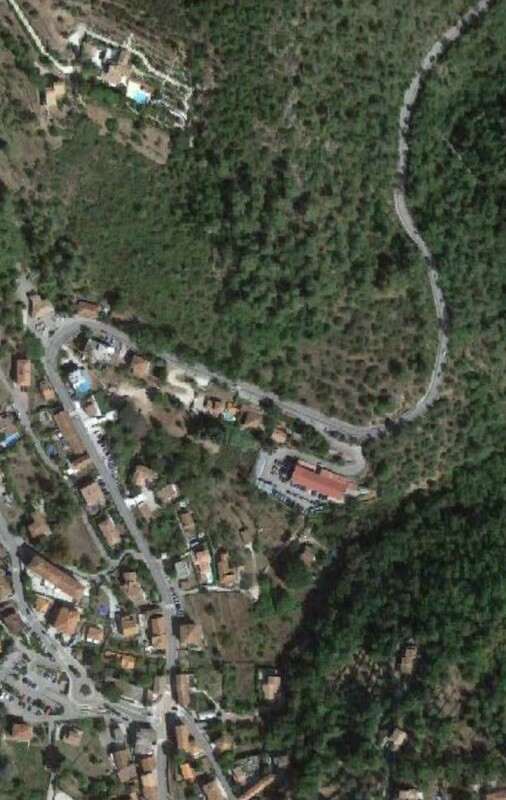 The two houses in the top-left corner of the image can be seen on the bottom-right of the following image, for a short distance the route travelled roughly in a Westerly direction before turning north to follow the contours around a small valley, then rounding a hillside before leaving the image close to the top-left corner. I ahve not been able to find any images which relate to the tram route between Tourrette-Levens and Saint Blaise and so am not able to be absolutely sure of the route, form this point on, however the lie of the land suggests that the tram will have followed what are now the roads linking Aspremont and Saint Blaise. 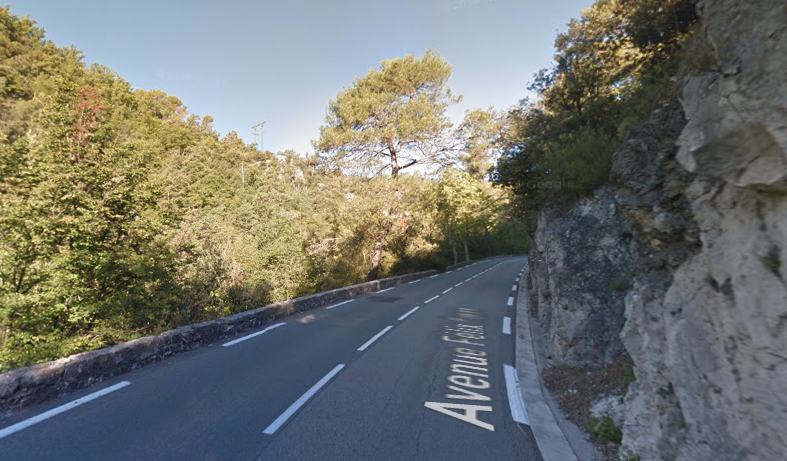 The road out of Tourrette-Levens is named Route d’Aspremont (M719). It follows the contours as much as possible, to keep gradient shallow for the trams. The route shows clearly on the map below. Aspremont was approached from the East. The road running North to South narrows to not much wider than what would have been the formation of the tramway in the region of La Plaine and La Prarie above. 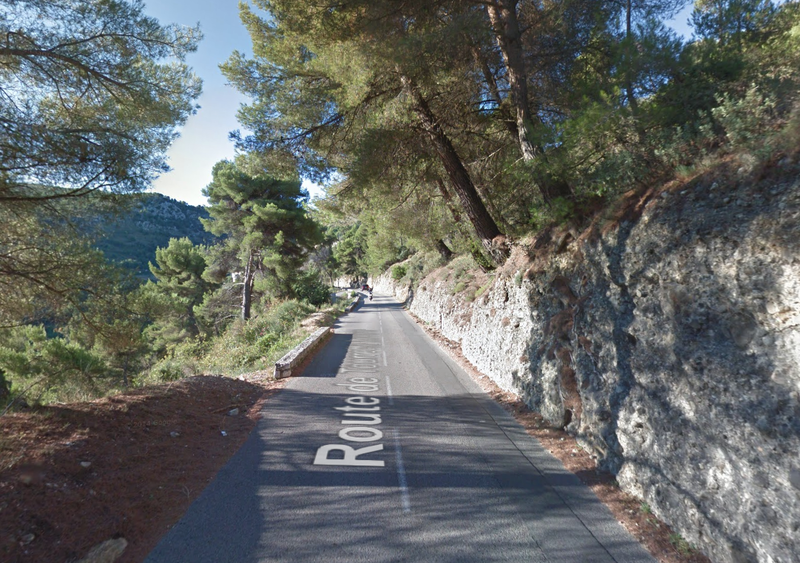 The road, by now, is known as Route de Tourrette. 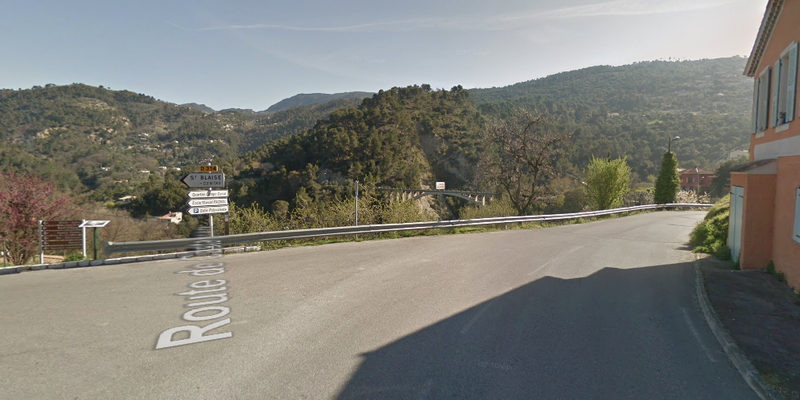 The route then curves to the East to approach Aspremont. 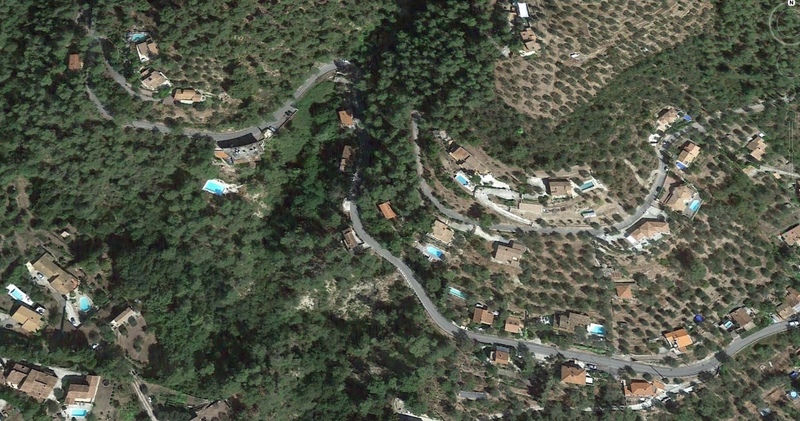 Aspremont is to the left of the satellite image below and the tramway route comes in on the right of the image just below centre. 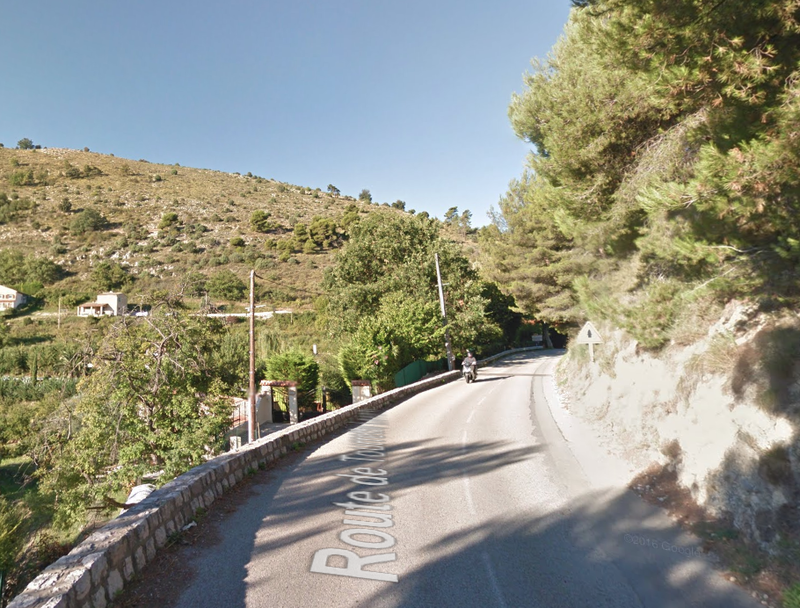 It approaches the perched village curving southwards before taking a hairpin turn in the market area of the village before heading northwards on the Route de Castagniers. 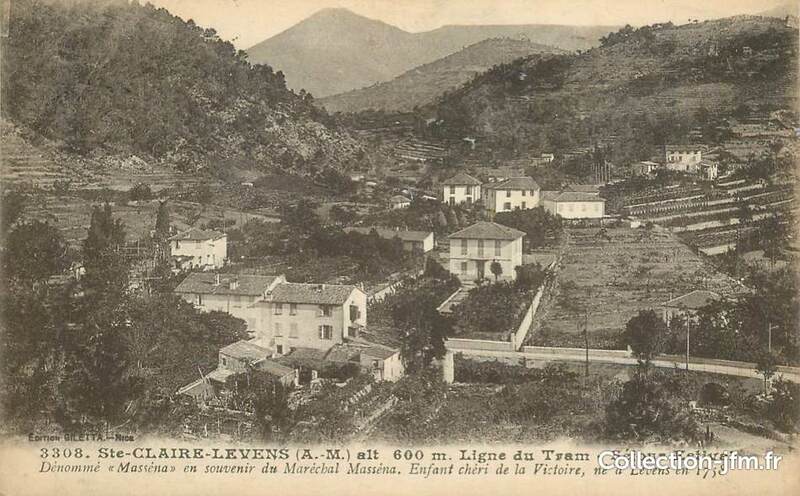 On the image above, the trams from Tourrette-Levens arrived from along the road on the immediate right of the chapel and trams from Saint-Blaise (and Levens) arrived from the left of the picture. The route out of Aspremont is shown on the image below. Travelling north from Aspremont the tramway followed the Route de Castagniers high above the valley of the River Var on a ruling grade downwards towards the junction of the road to Castagniers and Saint-Blaise. The route continued approximately northwards, high above, the Var through La Loubiere and La Croix de Fer, still on a gently downward grade. 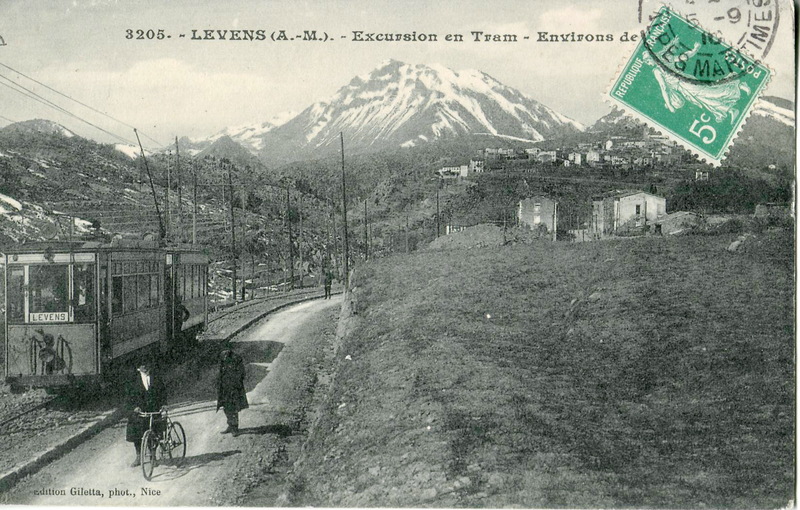 At La Croix de Fer (below) the tramway turned away from the Var to head westwards towards Saint-Blaise. 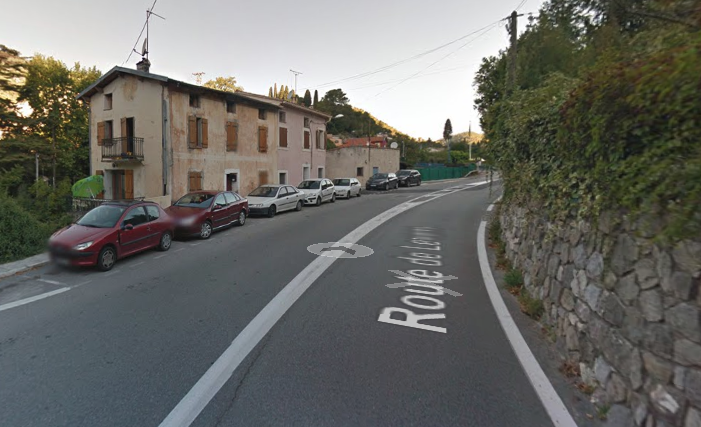 As the trams approached St. Blaise they were still running on a downward ruling grade and had to negotiate two hairpin bends as they approached the village. The tramway stayed above the village itself heading for what was in its day a suspension bridge carrying the route over the valley of a fast flowing tributary of the River Var. 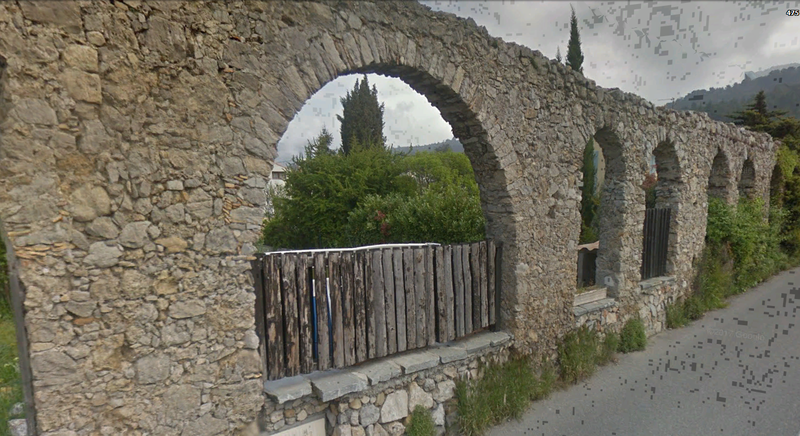 The replacement bridge can be seen in the google streetview image below. The original bridge was an 80 metre long suspension bridge just outside St. Blaise. Built for the tramway in 1908, it also carried the St. Blaise to Levens road. This graceful suspension bridge was destroyed during the Second World War. The replacement bridge was not built until 1953, by which time, in this scenario, the trams were long gone! 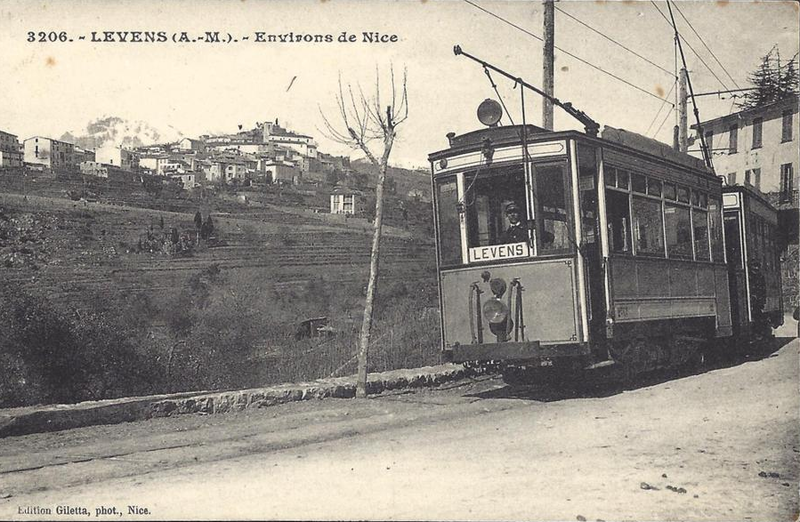 After crossing the Pont de Massena the trams headed along the M14 towards Levens. 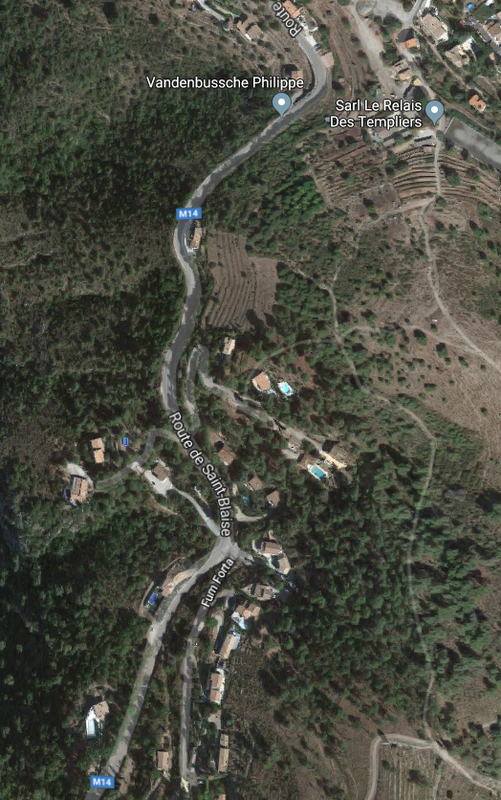 In our imaginary scenario, these next few satellite images show the route from Levens to St. Balise to meet up with the Pont de Massena. 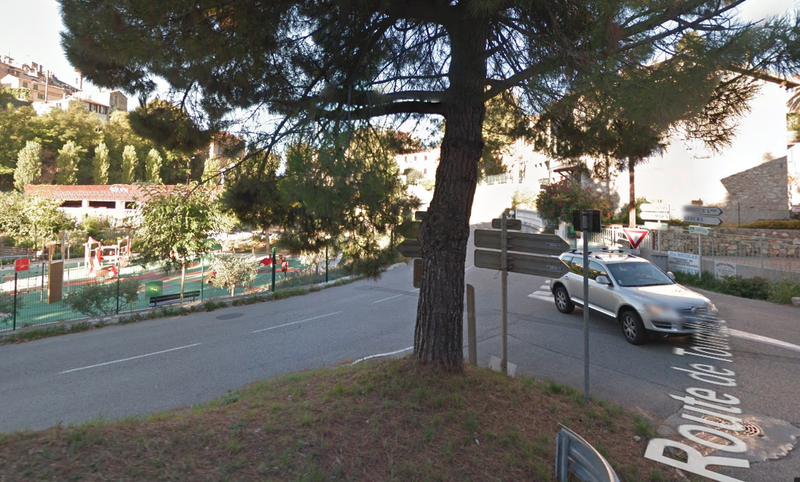 In this scenario, the tramway left Levens on the road now called the Avenue General de Gaule and then turned right onto the Route de Saint-Blaise (M14) and then followed that road all the way to Saint-Blaise. Please note,again, that the description in italics above and the images which go with it are of an imaginary, “might-have-been,” route of the Levens tramway. Ultimately, this “might-have-been” scenario, is supported, primarily, by just two things. 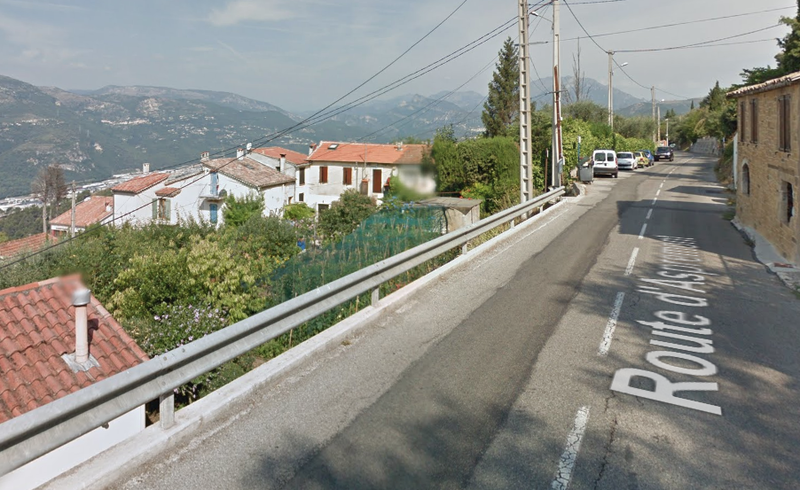 The suspension bridge at Saint-Blaise, shown some distance above, and the profile of the possible route through the Village of Saint-Blaise. The Actual Tramway Route Between Tourette-Levens and Levens, along what is now the M19!! I hope the text above has not confused you too much! It is a “flight-of-fancy” based on a few sources which I used when looking at the route back in late 2017 while on holiday in Nice. 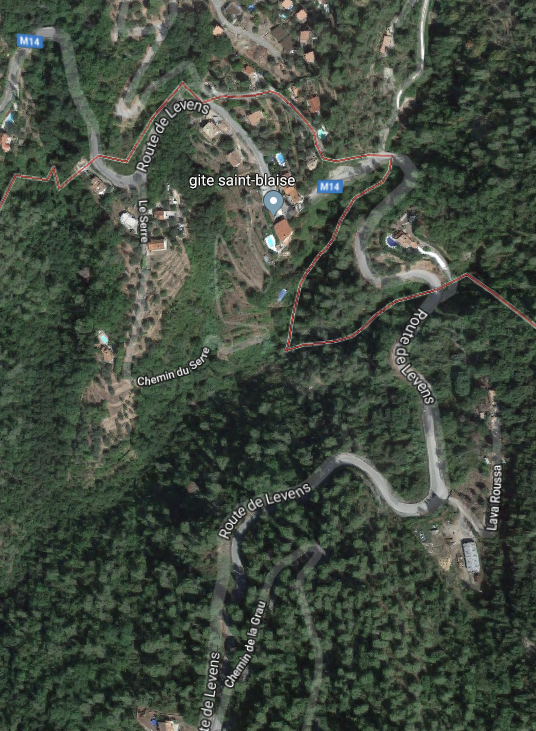 I think some lengths of the road, and probably the suspension bridge were built with an alternative tramway route in mind. But the tramway was never built. The actual tramway route followed what is now the M19. 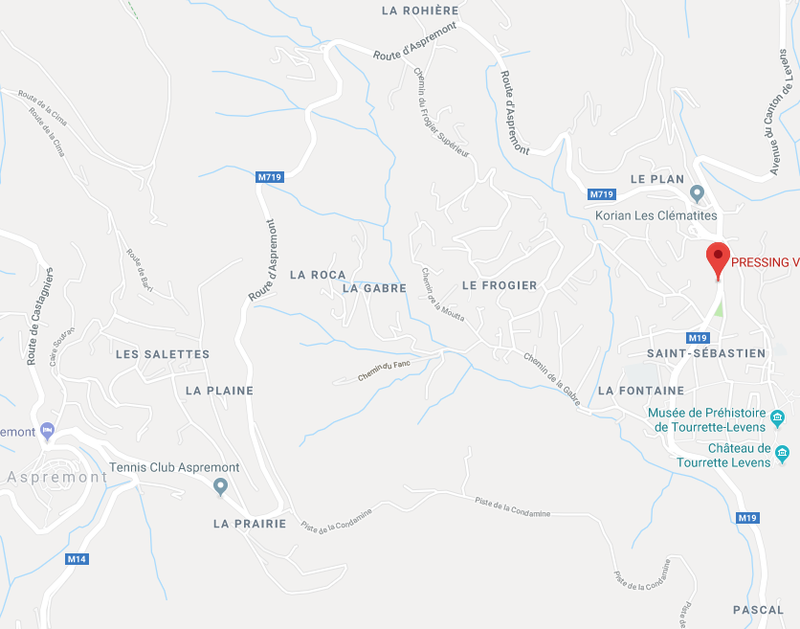 According to the works of Jean Robert  and José Banaudo, the tram to Levens did not pass through Saint Blaise but followed, mainly on the shoulder of the M19, sometimes on the road and also a few kilometres on an independent formation. The route travelled through Moulins-de-Tourette, Tourrette-Levens, Laval and Ste Claire, to end at the place called Les Traverses, below the village of Levens. The line was put into service in June 1908. An extension of one km was under construction towards Levens-Village in 1914, but the works were delayed and then suspended by the war and, despite some sort of recovery after the war and the construction of a 95-m-long tunnel in a semicircle the permanent way was not laid and the extension was never opened. So, back to Tourette-Levens, and this time no flights of fancy! The station at Tourrette-Levens was on Boulevard Léon Sauvan in the centre of the lower part of the village. As trams left the centre of Tourrette-Levens they followed the present M19. The road and the tramway swing sharply away to the East after leaving the northern edge of Toureete-Levens. 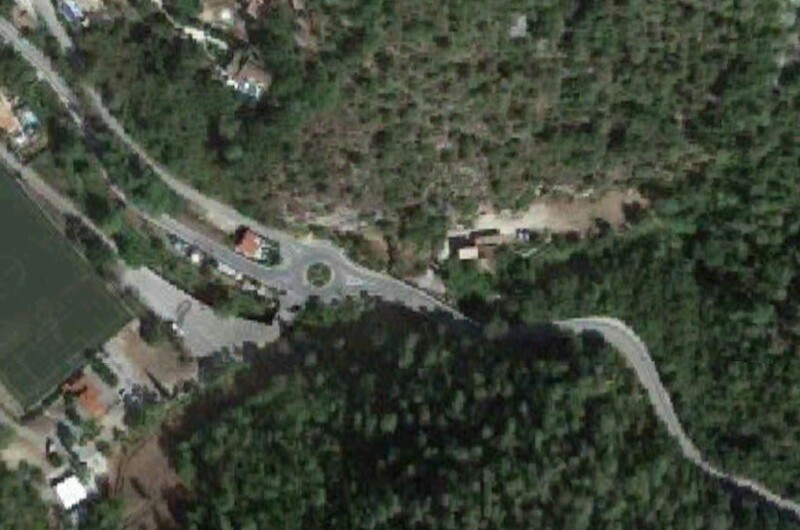 The M19 is known as the Avenue du Canton de Levens and swings north as it meets the valley of the Rio Sec. It runs high above the river in the valley below. It then crosses the river and travels on its North-East bank, towards La Columbier Le Plan d’Arriou, below, is followed by Le Columbier. 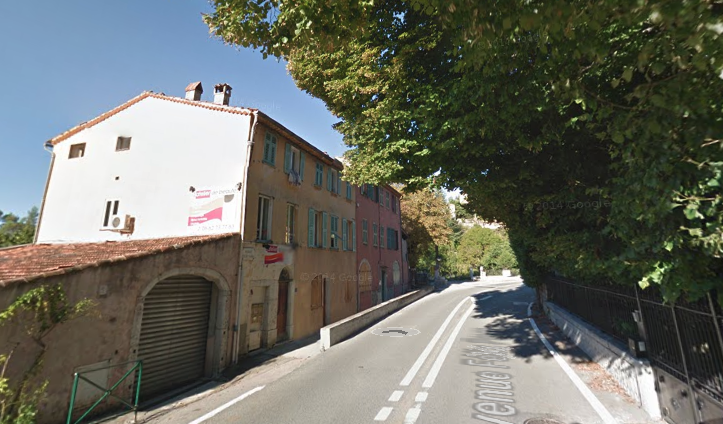 The route continues along the M19 towards Levens through Laval and closely following the North-East bank of the Rio Sec, along the Route de Levens and then Avenue Felix Faure before entering the area of Saint-Claire (the third image below). 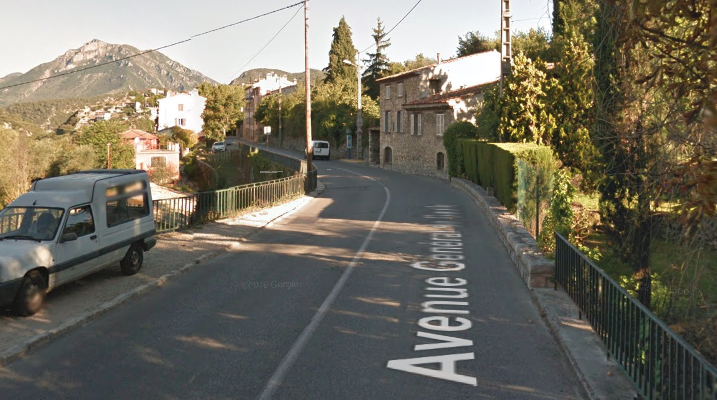 As Avenue General De Gaulle stretches ahead of us we atart to pass thorugh the locations of early 20th Century images. 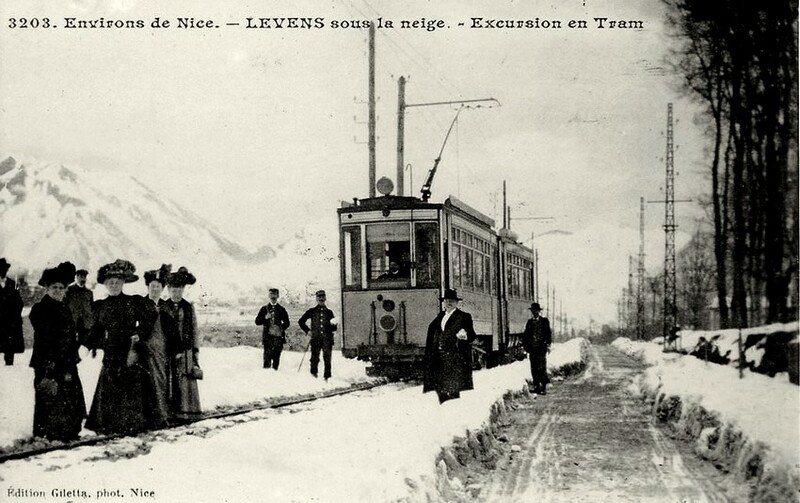 The first is of a tram in the snow. 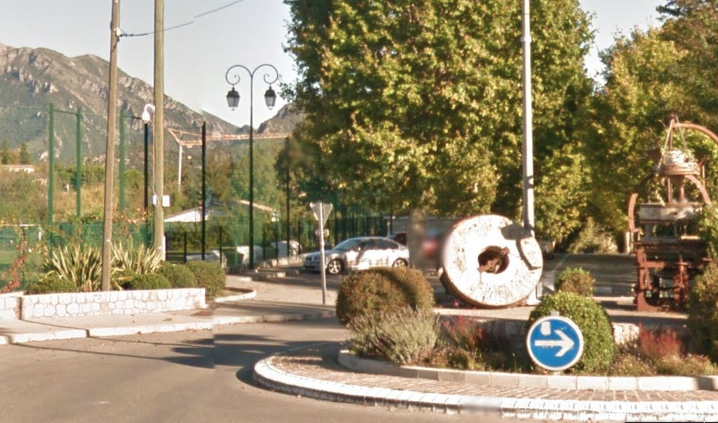 In the modern image, there is no snow, the trees are planted approximately in the line of the tramway and, of course, the roundabout is new! 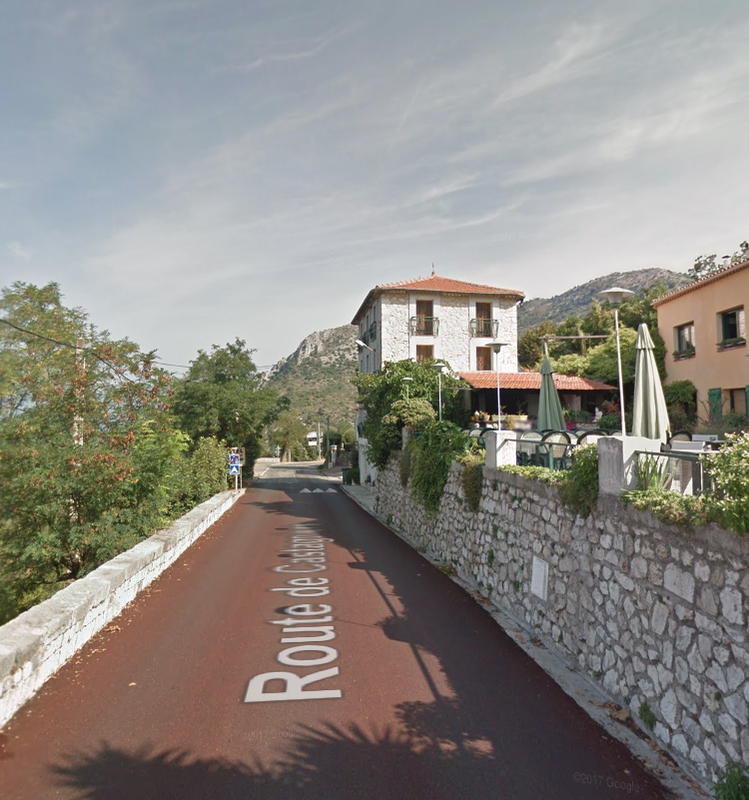 This next pair of images are difficult to tie together but the bend in the road in the modern image correlates to the bend in the centre of the older postcard. As can be seen in the old postcard the tramway was separated form the untarmacked (dirt) road by a small kerb, and the road was only wide enough for one vehicle. 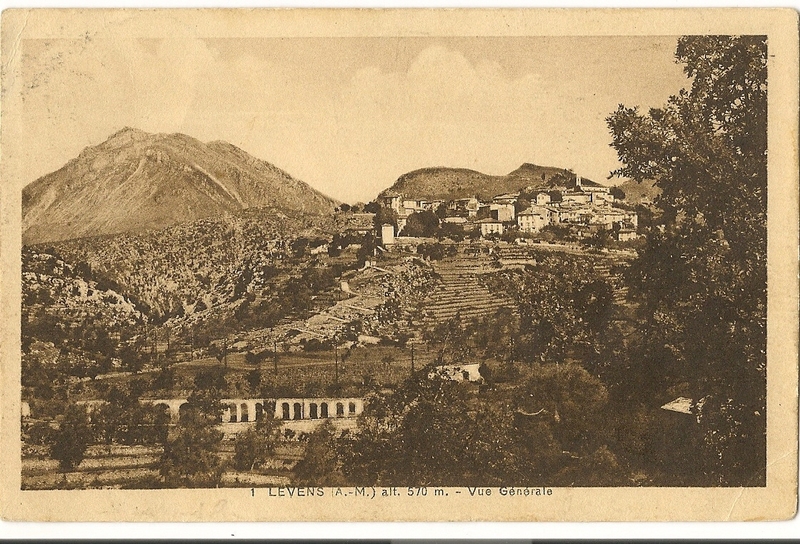 Just round the bend, in the modern image above, we reach the location of this next postcard which is well composed with the tram in the foreground in front of the small hamlet with Levens sitting nicely under the hills beyond. The modern image below shows the same location in the 21st Century. The railings and buildings tie down the location, the trams are long-gone and the road is now a much more substantial. 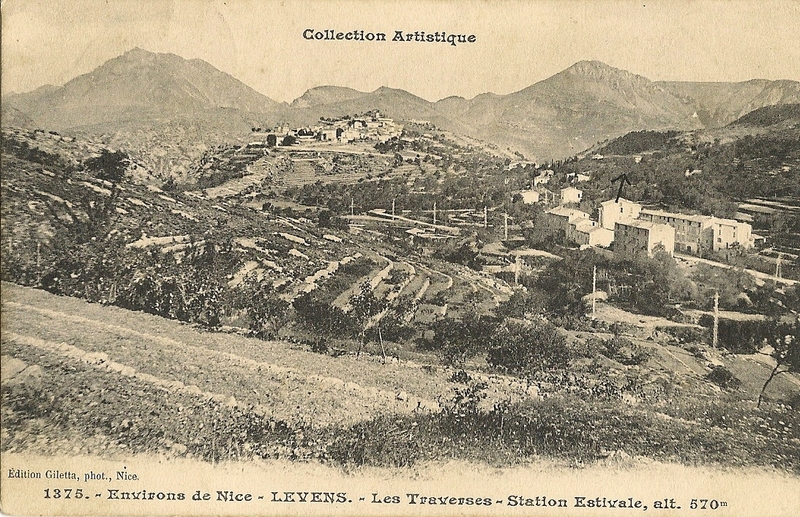 The postcard above shows the road/tramway coming in from the right towards Les Traverses and heading towards Levens in the background. 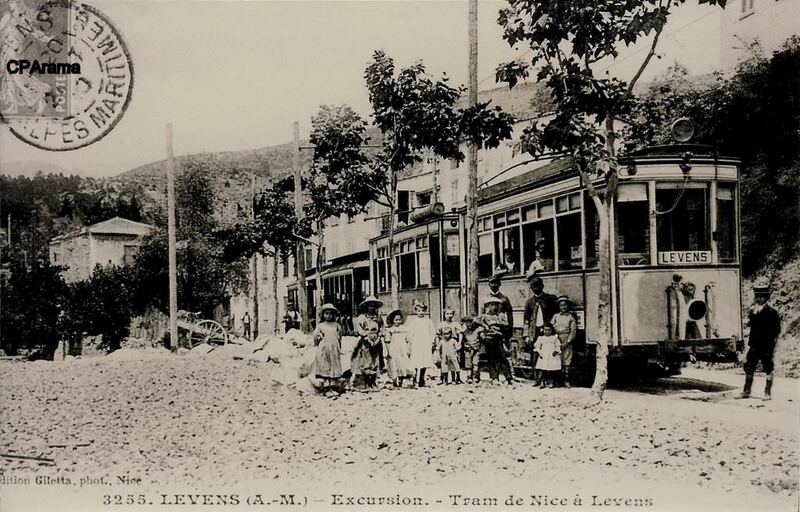 Trams continued along the road towards Levens, through Les Traverses and on towards Saint-Roch where they terminated in the valley below the village of Levens. The Saint-Roch terminus is shown below. Again the modern image approximates the camera position from the postcard as best can be. It was always intended that this terminus of the tramway should be temporary. The promoters planned to access the centre of the village of Levens and work was well underway at the advent of the Great War. That conflict resulted in all works being placed on hold, despite most of the infrastructure being in place. 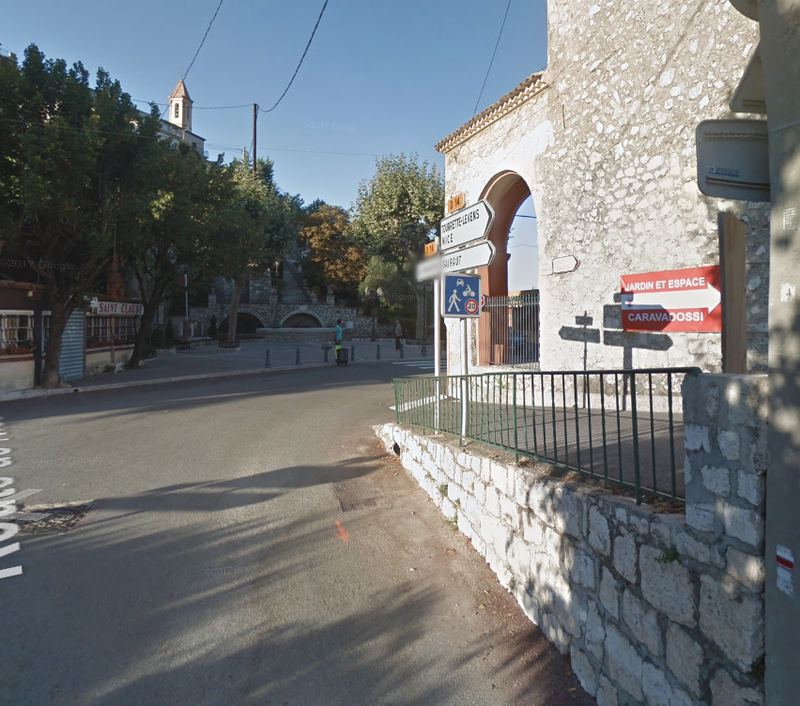 The buses now follow the planned route for the trams from Saint-Roch to Levens Village. 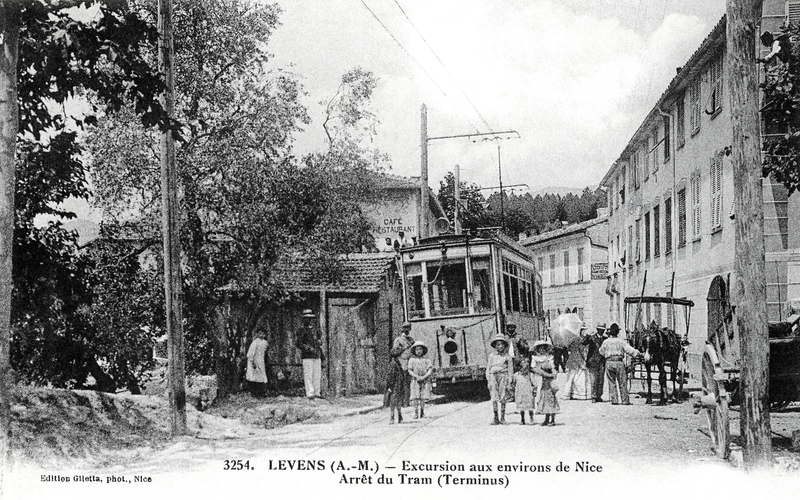 Trams reached Levens (Saint-Roch) in 1908 – work had started on the line in 1906. It was abandonned by the mid-1930s. Throughout the life of the service, there was only limited take-up of the service by the public, three trams ran each day in each direction along the full length of the route, supplemented by some partial services. Two interesting views came to light while looking at images of Levens for possible evidence of the route of the trams. Both seem to show a viaduct or aqueduct. 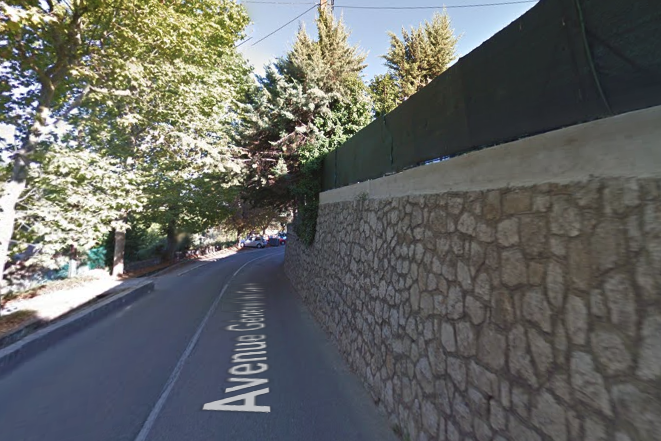 Some discussion about these images on Passions Metrique et Etroite resulted in what is now little more than a garden wall with arched openings being found on the Route de la Roquette. So, is it just that, or is it the remains of an ancient aqueduct. 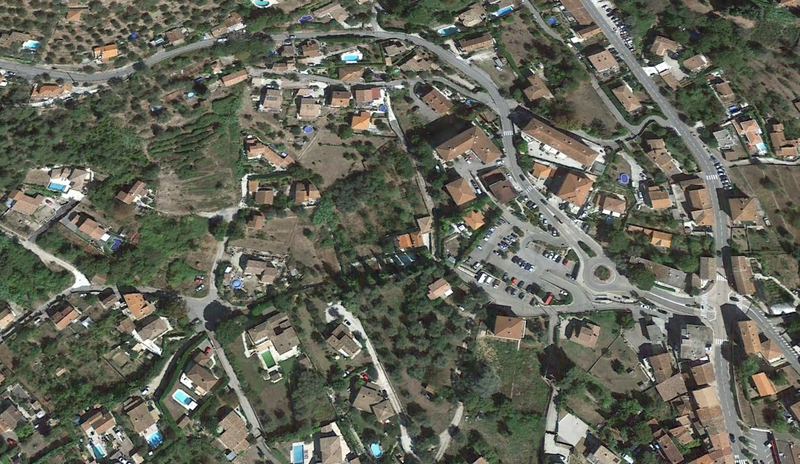 In the postcard images it seems more substantial than in the google earth images from 21st Century. What is it? Jose Banuado; Nice au Fil du Tram Vol. 2, Les Editions du Cabri, 2005. Jean Robert; Les Tramways de Nice et de la Côte d’Azur, 1988. 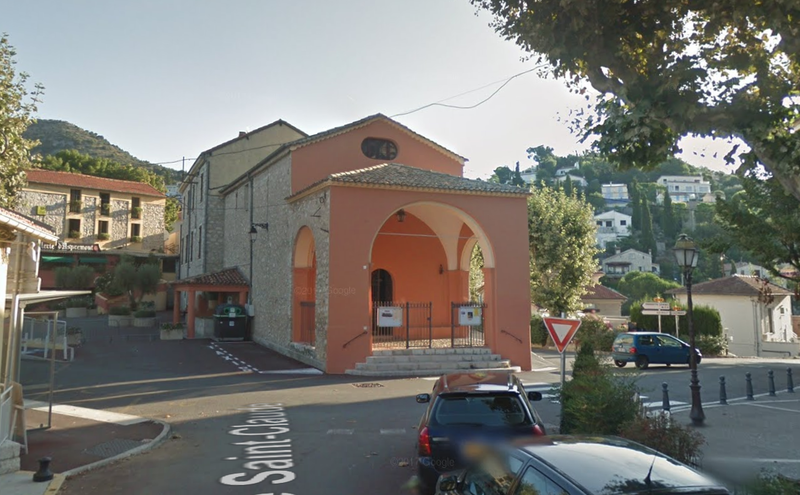 242T66; Passions Metrique et Etroite Forum; Archéologie Ferroviaire, les TAM; http://www.passion-metrique.net/forums/viewtopic.php?f=2&t=8464&start=60, 26th March 2018.
http://transporturbain.canalblog.com/pages/les-tramways-de-nice—de-l-apogee-au-declin/31975780.html, accessed 15th March 2018. 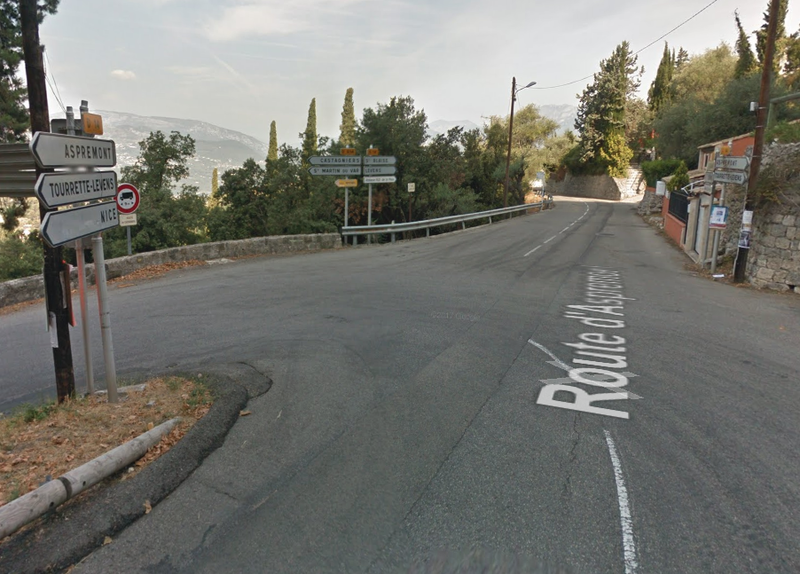 This entry was posted in Railways and Tramways Around Nice, Railways Blog on March 27, 2018 by rogerfarnworth.